The 695 mile-long Cumberland River begins at the confluence of the Poor Fork and Clover Fork at Harlan, Kentucky. At this confluence begins a beautiful river with a huge amount of variety in both scenery and navigability. From this point and for the first 142 miles the river is only suitable for and popular with those in kayaks, canoes and rafts. There are mild rapids on the upper Cumberland and plenty of remoteness for those wanting to get away from it all. The photo at right shows the point where the Cumberland River begins, with the Poor Fork flowing in from the right and the Clover Fork on the left. The exception to the "mild" rapids is at and for a few miles below the Cumberland Falls. The amazing 68ft falls is a popular tourist destination bordered by a state park. It is obvious that the falls must be portaged. If one visits the waters below the falls it is also obvious that it is for expert paddlers only with class III and borderline class IV rapids. The falls is famous for the "Moonbows" that occur only one other place on earth. These are rainbows created by moonlight. The photo at left shows the falls. For those not choosing to paddle below the falls there is an outfitter nearby with expert guides using inflatable rafts. Beginning just 14 miles below the falls, small power boats can launch for downriver trips through the beautiful country bordered by the Danie Boone National Forest. Just below Burnside, Kentucky the river will begin to show yet another personality as it slows down and widens. The widening will continue with huge coves and inlets forming in what is known as Lake Cumberland. 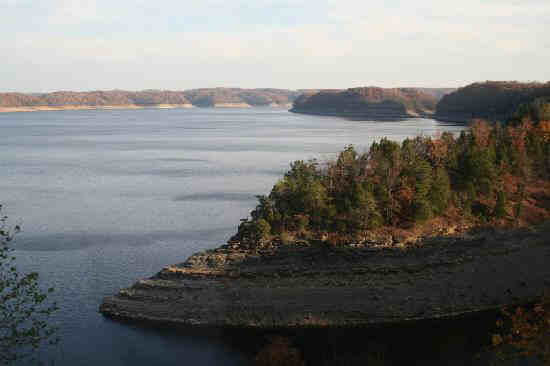 The lake is popular and can be traveled in about any size boat until reaching the Wolf Creek Dam. There the lake ends and the waterways becomes a river once again. There is no lock at Wolf Creek Dam so boats must be trailored or portaged at the dam. Even though the lake is popular it is big enough to find a quiet cove and enjoy the natural beauty of the area. Once below the dam the river stage and current depends greatly on how much water is being allowed through the gates and power plant at the dam. Paddlers will rarely have any problem but power boaters must check the release schedule at the dam to determine whether it is safe. Lake Cumberland is show at right. 381 Miles down the Cumberland River at Celina, Tennessee is the beginning of navigation for commercial vessels. This is the location of the confluence of the Obey River (shown at left coming into the Cumberland from the right side). From this point and to the end of the Cumberland there is a defined deep channel with navigational aides and a few locks to keep the water at pool stage. Tow traffic is actually fairly rare but the natural beauty of the Cumberland continues as one travels the winding river past huge bluffs and the many tributaries that offer safe anchorage and remoteness. The photo at right is a typical scene on the Cumberland and most who explore it have the river to themselves much of the time. Unlike the lakes the river does not attract as many day boaters and most fellow boaters in these remote sections will be fishermen, since the fishing in these waters is excellent. The good news is that there is an adequate number of marinas for those traveling great distances who will need fuel and supplies. The current is usually mild with the exception of periods of high water. room. River people appreciate a community that embraces their river heritage and Nashville is one of those places. Downtown Nashville is shown from the river at left. The river shores becomes natural very quickly once past the city and industrial section at Nashville. The Cumberland never looses its charm even though it changes faces often. The photo at upper right was taken near Ashland City, Tennessee and shows that the lower section of the Cumberland is as beautiful as the upper reaches. The River will eventually widen once more going down river as it becomes Lake Barkley. This lake has some beautiful remote shoreline with plenty of nice coves along the "Land Between the Lakes" section. There are also plenty of marinas and lodging opportunities on Lake Barkley. With one more downriver lock and dam that forms Lake Barkley the Cumberland flows another 31 miles to Smithland, Kentucky where it pours into the Ohio River. From this confluence one can travel to many great places along the Ohio, Tennessee, Mississippi and other great rivers. For many years I traveled on the Cumberland River while working aboard the Delta Queen Steamboat. The trips went as far upriver as Nashville and downriver to the Ohio River. Since then I have explored the Cumberland River above Nashville by powerboat to just below the Cumberland Falls and by canoe from the river's source at Harlan, Kentucky to the falls. I also scouted both shores of the river by car to gather additional information for the Cumberland River Guidebook. During all these trips I have gathered a great deal of information and taken many photographs of this beautiful river. The Cumberland as much to offer the river voyager and the guidebook provides all the information needed to safely travel the river, including canoe put-ins and take-outs, boat launching ramps, food, supplies, lodging, marinas, hazards and much more. The guide contains 58 charts that show the each feature of the river in great detail. The Cumberland River Guidebook is now available in our book store. Please visit this page often for updates and additional information.